It's no secret that I love color. I couldn't wait to infuse pops of color into my new apartment. 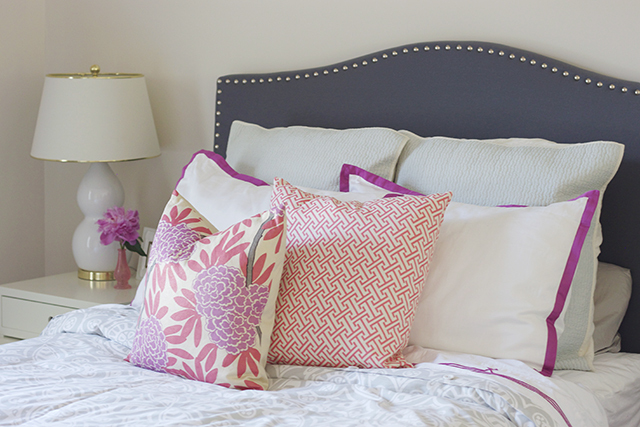 With soft tones of gray and light blue in my bedroom, I chose to accent it with a splash of berry and pink. Hey, I got to get out this pink obsession. Who knows when I'll have to begin thinking about what colors a guy actually likes?! 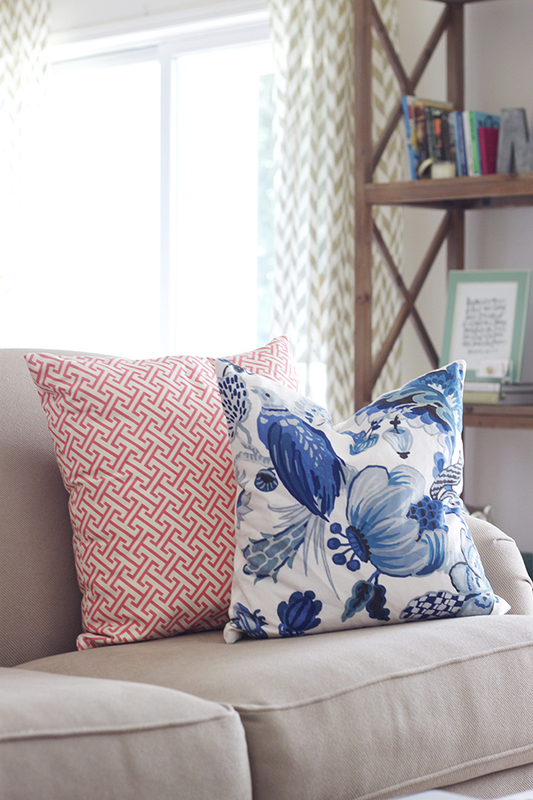 ;) Pillows are a great way to spice up the room with color, texture and pattern. It's also a very small item in the grand scheme of things, so if you want to change it out in a few months, you can definitely afford to do that. 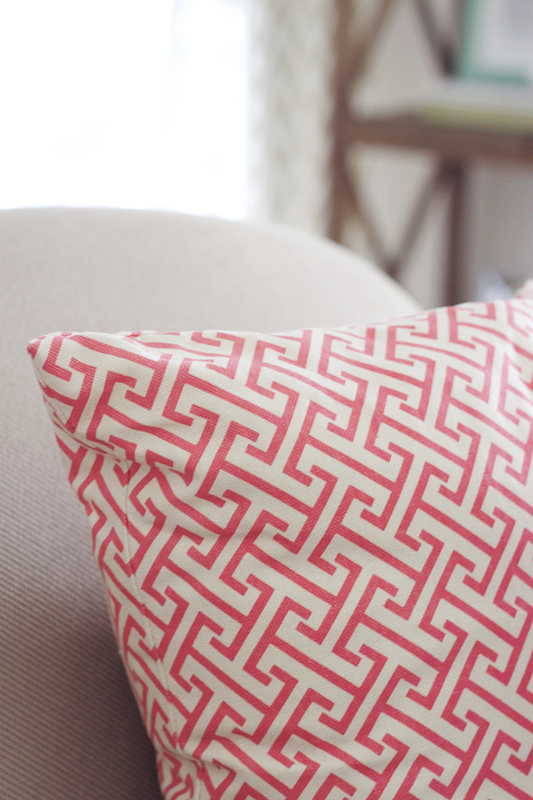 I recently picked out these Caitlin Wilson Textile Fretwork Pillows. I just can't decide where they should stay! (Do you have that problem, too?!) I love them in my bedroom and love them in my living room! Here are some photos of them in both locations. Isn't the coral oh-so-lovely?! :) Where do you prefer the pillow? Happy Wednesday! One more day of work and then a long, fun weekend of celebration! I'm with you - such a color girl! And, as you might recall, I have a pink rug in my entryway in a house with a man living in it. You can still work it bits of it here and there :) Love how your apartment is coming together - so fresh and bright and cheerful! I'm loving your pillows! I've recently realized that switching them out from time to time can really help elevate your space without having to change out all the furniture you already have! gorgeous pillows! it's coming along so well! I think they look extra fun in the living room, such great colors and patterns!!! Your apartment is coming together nicely. Maybeee you should pick up a couple more because I love them everywhere!! Can't decide! Love your headboard! I also love how clean everything looks!! Love all of those fun, bright pillows!